There was a lot more snow on this trip than on the last outing. Perhaps 18 inches of new snow had fallen overnight, and contrary to the forecast it remained cloudy all day. We chose this route as it offered low risk terrain for the extreme avalanche danger that was predicted that weekend. 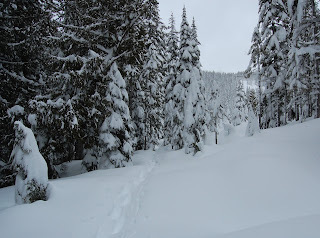 Others were less fortunate -- three died that day at Stevens Pass, and a fourth behind Alpental.